just saying ...: Happy Birthday ... to me ! Today is my birthday ... and, as everyone else has gone off to work and to school, it's just me and the Wonder Dog here having a party. And in our own quiet way we're having a ball. 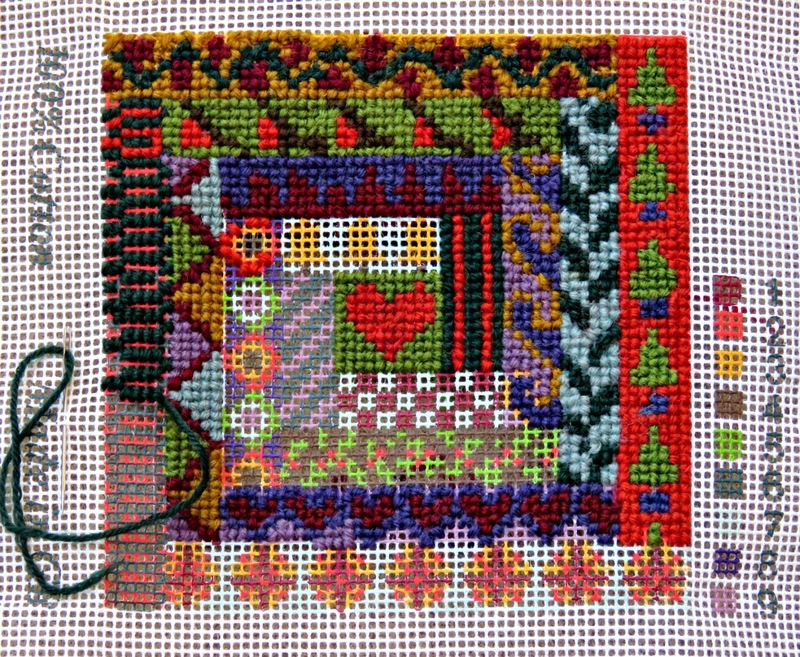 It's a cross stitch sampler that I started umpteen years' ago - way back when I was single and long before I'd met Mr B. When I opened the box it was like opening a time capsule. A couple of photos fell out with the skeins of embroidery thread, and I was transported back to a holiday all those years' ago when I'd been working on the sampler. It was a real surprise to see my (tanned and much younger) self staring back at me surrounded by a group of chums that I rarely get to see these days. Oh my goodness, how things change! And then I had a look at my stitch-work, and I was really surprised to see how messy it was. You see nine years of being a mum has given me a whole education in patience and forbearance. The hasty stitches worked by my younger self spoke of a woman who was in a hurry to get things done, anxious to get places and with a host of things backing up on her To-Do List. On a whim I picked up the tapestry needle, threaded it and worked a line of stitches, enjoying the familiar rhythm as the it wove its way across the canvas, in and out and under working cross stitches. For a brief moment the sun shone in through the conservatory window. I felt grateful for the simple blessing of having such great light to sew in. At the end of the row I surveyed my work with satisfaction. All those years of toddler tantrums, irrational demands and being on the receiving end of a young child's whimsy had worked their magic. My stitches stood neat, and straight, and even, in marked contrast to the hurried efforts of half a life-time ago. I think I'm going to enjoy taking my time to finish this project, which is something that my younger self would never have got in a month of Sundays. I just wanted to thank you for the link (I must convince hubby to rent a car for a weekend away!) when I saw this: BUON COMPLEANNO e cento di questi giorni, cara Bonny! Happy Belated Birthday!! We do learn a lot as the years go by... being a mom teaches us so many things too. Hope you enjoyed your day.